Soren Bak defeated Paddy Pimblett this evening at Cage Warriors 96 to become the new Cage Warrirors lightweight champion of the world. The Cage Warriors lightweight title was on the line this evening as Paddy Pimblett took on Denmark’s Soren Bak in the main event of the evening in Liverpool. Bak, with his signature axe across his shoulder, was the first to make his way from the back and he was greeted with a serious amount of boos as he stepped out into enemy territory. Pimblett walked out to a fantastic ovation from the Echo Arena crowd and took in all of the love of hometown as he danced his way to the cage in his usual fashion. The two squared off for the final time and then the fight began with Bak advancing forward on the feet. Bak pushed Pimblett’s back to the cage with a right hand but Pimblett then timed a nice trip and took Bak down to the mat. Pimblett then worked for rear-naked choke and flattened the Dane out, but Bak somehow worked his way out of the position and managed to fight off the choke. Pimblett then worked ground and pound and controlled Bak on the mat for the remainder of the round to put a 10-8 in the bag. Pimblett then started off round two well and landed a series of right hands that Bak did well to take. The Liverpudlian then tried working an array of kicks and landed some stiff shots to the body before Bak returned fired with another stiff right hand to push the Scouser’s back to the cage. Bak then landed another stiff hook and then muscled Pimblett up against the using his bodyweight to drain Pimblett of energy. When the two finally broke apart Pimblett landed a headkick but Bak continued to march forward. The two went toe-to-toe to finish the round trading hooks in the pocket. Bak was the one pushing forward as round three began. Bak landed big right hands, but Pimblett again fired into the body with the kicks. A pivotal moment in the fight then occurred when Pimblett mistimed a trip and found himself on the bottom with Bak in half guard. After a period of trying to pass, Pimblett spun out but then found himself in further strife with Bak looking for a kimura whilst trapping his other arm with his legs. The Liverpudlian saw out the round but Bak definitely took round 3. The championship rounds continued with Bak the aggressor and pushing Pimblett up against the cage. After a period of not much happening referee Marc Goddard reset the fight in the centre of the cage and the two went at it again on the feet until Bak secured a bodylock takedown. Bak then passed Pimblett’s guard and then worked his way into full mount to land elbows. Pimblett did his best to scramble from the position but Bak simply wouldn’t let up with his ground assault. Pimblett then briefly looked for a heel hook but Bak negotiated out of it easily before the round finished. The final round began with both men looking to land hard single shots and it was Bak again who was the one pushing the pace on the front foot looking push Pimblett’s back to the cage. After a brief period of grappling Bak secured a takedown but then found himself defending a kneebar with ground and pound. Pimblett then looked scramble to safety but only managed to have his back taken with Bak working ground and pound both from his back and then from full mount. Time then expired with Bak pounding away on Pimblett. The judges then returned their scorecards with Bak winning 48-44, 48-45, 48-46. 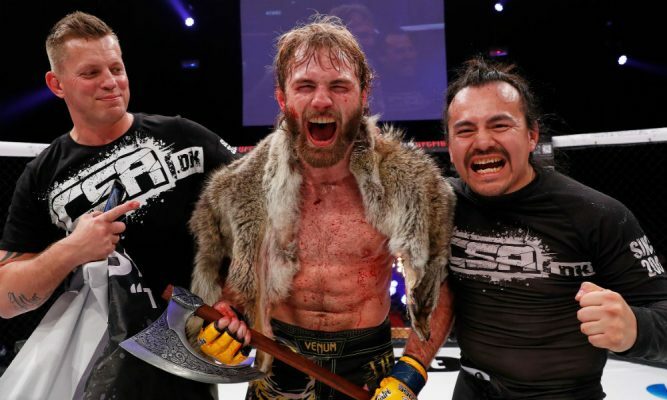 Soren Bak is the new Cage Warriors lightweight champion.